Moving on to graduate school after being accepted into a Physician Assistant Program is Castleton Health Science alum Rachel Preusser. The 2013 graduate says her Castleton education and hands-on college experience helped prepared her to pursue her dream career. Preusser said her hard work was rewarded with good grades, but even more rewarding was the enthusiasm of the professors when asked to write her letters of recommendation for graduate school. Adding that she was able to get one-on-one learning time with her professors due to small class sizes and knew many of them by name, Preusser credits her department’s commitment to their students with allowing her to flourish in the classroom environment. Biology Professor Peter Kimmel was at the top of the list of those who impacted Preusser’s career path, not only as a professor but also her academic advisor. His expertise proved key when selecting class schedules, applying for various jobs and scholarships, and when making the decision to further her education. “He was a huge impact on my academic success then, and now,” said Preusser, who still keeps in contact with Kimmel regarding her future educational endeavors. 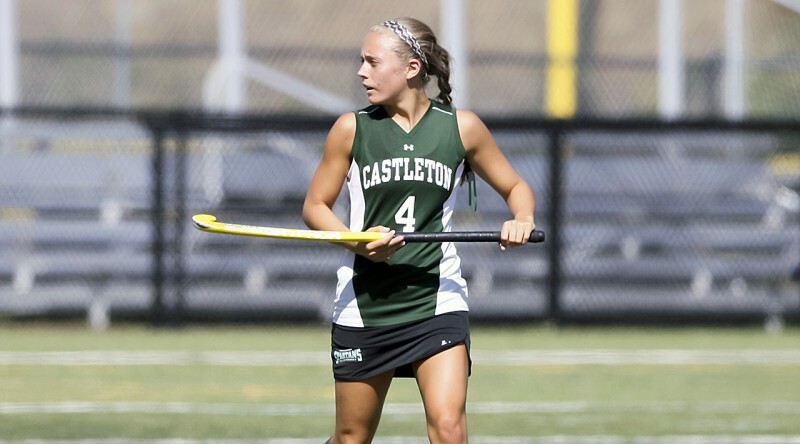 Also a student athlete Preusser enjoyed her time spent on the field hockey field during her years at Castleton.